Mannequins will find especially useful for window dressing and display of all kinds of clothes in shops gentleman. We also have lady mannequins with or without head, with or without makeup, with or without wig, with different positions, realistic or featureless, to give his own style showcase. You can also find children's mannequins, children and babies. On the tab of each product you will find IMPORTANT DISCOUNTS FOR AMOUNTS buying. 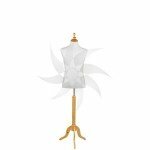 Here are a list of all related categories with mannequins, where you can find all related products that equip your trade or shop.